Capital Humane Society’s Working Cat Program is intended to provide a placement option for cats with behavior issues or temperaments which make better suited for an outdoor lifestyle. The program’s purpose is to find appropriate outdoor homes for these cats outside of Lincoln city limits within Lancaster County (qualified homes within close proximity to Lancaster County may be considered depending on the distance from Lincoln). They live in a structure that is a free standing building, safe from the elements, that the cat can get in and out of easily like a barn, stable, shop, or outbuilding where they have a "job" and a better quality of life. These cats have been given medical care and are spayed/neutered prior to placement to prevent any future litters of kittens. As an adopter of a working cat(s), you provide them with daily food/water, protection from the elements and predators, and long term care including veterinary care. These cats will return your gift of a home by working to catch rodents and keep away other unwanted animals. Working cats range from semi-feral to social cats with behavior issues that make them unsuitable for an indoor home. Semi feral cats are used to some human contact but prefer to keep their distance. Over time, a semi feral cat may become more receptive to human contact and become more social as they settle into their new outdoor home. Cats which are candidates for our Adoption Program or currently in our Adoption Program are not eligible for adoption as working cats. 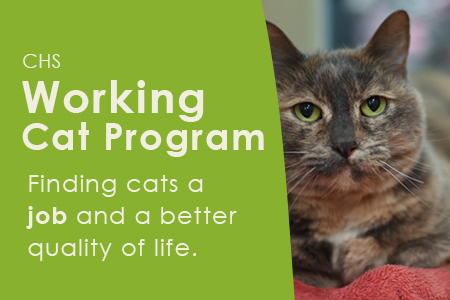 Working cats are available for adoption at a reduced fee of $50 plus tax per cat. However, because of a partnership with Joining Forces Saving Lives and grant funding they have from Maddie's Fund they are able to subsidize a portion of the adoption fee with Capital Humane Society subsidizing the remainder of the adoption fee. Therefore there is no cost to adopters who qualify to adopt working cats. We recommend adopting working cats in pairs. Complete the CHS Working Cat Adoption Application below. Our Foster & Offsite Adoption Coordinator will review the application and identify cats best suited for your outdoor situation. After the veterinary staff has completed all veterinary care for the cat(s), the Foster & Offsite Coordinator will setup an appointment to visit the property and deliver the cat(s). You will need to confine the cat(s) to the large crate or open-air kennel for a minimum of two weeks for the cat(s) to acclimate. If the cat(s) can be confined in the building for those two weeks, the crate or open-air kennel may not be necessary. Some cats may need to be confined for three weeks depending on their social level or previous history. A large crate or open-air wire kennel will be provided by the Foster & Offsite Coordinator for the confinement period. After the two-week period, the cat(s) should be confined to the structure, if possible for 2-3 days. The cat(s) should not be released during wet/rainy weather. During this time the cat(s) will learn the structure is where they will receive food and water therefore they are more likely to remain on the property after they are released. The adoption process will be completed and payment will be taken when the cat(s) are delivered to the property. After three weeks, the Foster & Offsite Adoption Coordinator will schedule a follow up appointment to return to the property and check on how the cat(s) have acclimated, answer any other questions, and pick up the crate or open-air wire kennel. If you have any questions about the Capital Humane Society Working Cat Program, please email us at foster@capitalhumanesociety.org or give us a call at (402) 441-4488 ext. 2. Is the facility heated where the cat(s) will reside? If you have dogs on the property, are they friendly with cats? If you have other cats on the property, are they all spayed/neutered? What is the main purpose for wanting a working cat(s)? Would you be the primary caretaker of the working cat(s)? If no, who would be the primary caretaker? Do you have a safe place to enclose the cat(s) during the acclimation period? Are you willing the keep the cat(s) in a crate or open-air kennel, if needed for the acclimation period? Have you had working cats before? If yes, where are they now? If no longer around, what happened to them? Are you able to provide daily food/water, protection from the elements & predators, and long term care including veterinary care?